The Intensity Scale (sometimes called the Gray Scale) not only controls the Image Contrast within all displayed images but it also controls how the Red, Green and Blue primary colors mix to produce all of the on-screen colors. The steeper the Intensity Scale the greater the on-screen image contrast and the higher the saturation of all displayed color mixtures. So if the Intensity Scale doesn't follow the Standard that is used in all consumer content then the colors and intensities will be inaccurate everywhere in all images. In order to deliver accurate color and image contrast a display must closely match the Standard Intensity Scale. Figure 3 below shows the measured Intensity Scales for the 3 Calibrated Screen Modes alongside the industry standard Gamma of 2.2, which is the straight black line. Both the eye and the Intensity Scale Standard operate on a logarithmic scale, which is why the Intensity Scale must be plotted and evaluated on a log scale as we have done below. The linear scale plots that are published by many reviewers are bogus and completely meaningless because it is log ratios rather than linear differences that matter to the eye for seeing accurate Image Contrast. Figure 3 below shows the variation in the Intensity Scales between Low APL and 50% APL. There is only a small Shift in the Intensity Scales, with the Gamma varying from 2.21 for Low APL to 2.24 for 50% APL. As a result, the Image Contrast remains unchanged with APL. In addition, we expect the Absolute Color Accuracy to only have small variations with APL, which is examined in Figure 4. 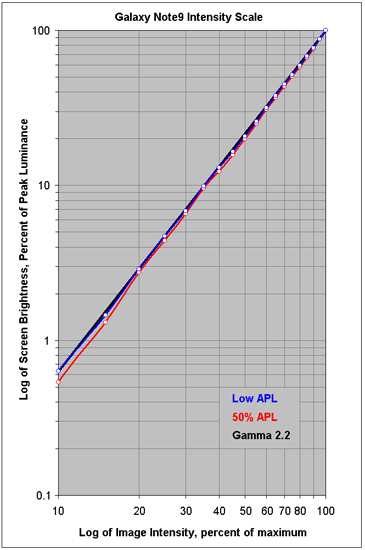 Gamma is 2.21 for Low APL and 2.24 for 50% APL.